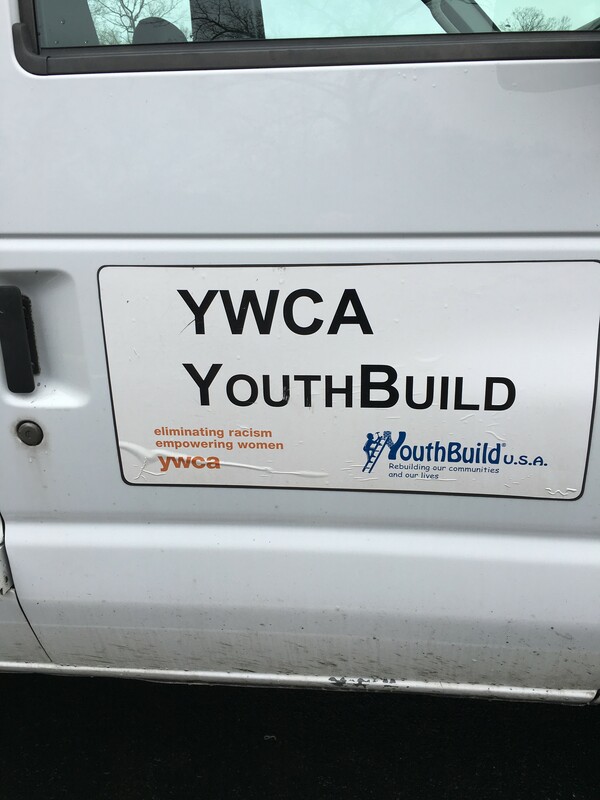 SPRINGFIELD - The YouthBuild Springfield program at the YWCA of Western Massachusetts, one of 11 in the state, is aimed at helping at-risk teens and young adults become better skilled at accomplishing goals and improving employment opportunities. Twenty-year-old Springfield resident Joseph LaBelle knew firsthand what it is to be out of options when he became part of the program a year ago. His youthful history included several arrests, educational failures and the "difficult" knowledge of his mother's overdose on heroin and cocaine. "I spent many years going in and out of schools until I finally quit and opened a moving company with a friend. This worked well until winter hit, and we had nothing. I was stuck with doing nothing or finding a place to go," said LaBelle whose family lived in Texas and then Florida before returning to the commonwealth when he was an adolescent. "A couple of YouthBuild students the year before me were good friends of mine and told me to do it. They had some of the same issues as me. They couldn't make it through school. They couldn't keep along. Just issue after issue. They came here and they flew." During the last 12 months, LaBelle has gotten his high school equivalency diploma, job training for construction work and earned the respect of the staff who taught him. "Just being told I was allowed to come was an uplifter. I felt coming here would open doors, that I could get my life back," said LaBelle, who was recently hired full-time by an area golf course to help with facilities management. "I got out of bed everyday and had something to look forward to. I passed my HiSET (High School Equivalency Test) and got my HBI (Home Builders Institute pre-apprenticeship certification). It gave me future goals." LaBelle credits the YouthBuild staff, in particular construction manager and classroom construction trainer Charles 'Chuck' Dustin, with teaching him how life can be broken down into small, achievable steps, and how thinking ahead can avert unintended consequences. "They talked to me. What I needed was somebody I could go to and talk to," said LaBelle of staff that helped him face fears and set goals. "I would have something eating at me and say I don't know what to do and by the end of the conversation, I would be smiling somehow." When asked how he was encouraged to take responsibility, LaBelle quoted Dustin's approach to "look at it this way." "He would take the whole situation and flip it. He would be, 'What if you looked at it like this, or move around it like this type of way.' He would give me ideas on how to manipulate a situation in a positive manner. This has gotten me through a lot," said LaBelle, interviewed the day before his graduation ceremony from YouthBuild on April 27.He added that Dustin "always told me to have another goal once you accomplish a goal and don't make them big goals, but small goals that get bigger and bigger." "He said, 'You have a truck sitting in your driveway, get it running good. You have another vehicle that your grandmother is willing to give you, OK. You want to get you HiSET, OK. Got your HiSET, and you want your HBI, OK. Let's go out back (to the construction shop),'" LaBelle said. "I got my HBI and that turned into an internship. My goal for the whole year was to get a job, and just today I got a job." Hearing that his former student will be working 40-hours-a-week beginning May 1, Dustin told LaBelle he was "very proud." "You can learn and prosper now," said Dustin, adding LaBelle showed effort from the start. "When he came, the effort showed slightly at first but it was there and he wanted more. I could see that in Joe. He just had to know that was possible and we were here to help him," Dustin said. "Joe has learned everything I taught him and has dug deeper into things. He has wanted to know why, how is this done but why is this done in construction. It has been a real pleasure working with Joe. He shares well with other students." Elizabeth G. Dineen, the former Hampden County assistant district attorney who now heads the YWCA, calls LaBelle "an amazing success story" and one that she hopes will "inspire others to enroll here." "YouthBuild gives people a chance to finish their high school education, get their GED and learn a number of construction skills and become successful in life," Dineen said. She noted that LaBelle scored the highest of any participant in YouthBuild Springfield's 12-year history on his five High School Equivalency Tests, formerly known as "general education development." Jenniefer Davis, director of Workforce Development, welcomes the fact LaBelle has already been doing recruitment outreach for YouthBuild Springfield and plans to continue that involvement. "When they hear from a young person how the program has impacted their lives, they are riveted," said Davis of recruiting new participants. "Joe understands the power of the program and working on yourself." LaBelle said he enjoyed both the academic as well as the job training aspects of YouthBuild. In doing his pre-apprenticeship certificate training, he studied aspects of carpentry, plumbing and masonry. "The training would break things down like, in plumbing, we would learn to take apart a sink or, in masonry, brick laying. In carpentry, we would learn rough framing. It was a little bit of everything all in one," LaBelle said. "In academics, we could start with science or history, have a 10-minute break, and go back to science or history, and then have our lunch break after which we would do writing or literature. We would do part of a chapter on our own and the other part would be an assessment that we would do all together. It is a good system. " LaBelle said his progress has helped keep him in a "positive" relationship in his personal life, and that his desire "to stay on track" has prompted the end of some other relationships. He said he could not help one former friend understand that where the friend is now "is a good place and that he can go further." "I need people in my life who will not hold me back. If they don't want to go to school, do what is right for them, stay out of trouble, I can't be around them," LaBelle said. He added the professionalism of his YouthBuild teachers, including education instructor Jennie Mills and construction classroom trainer and master plumber Al Towne, has helped him mature and accept that "you can't always get what you want, but you have got to do what is right." "I want to take advantage of whatever comes across me in my life," LaBelle said. "Of course everyone runs into bumps in life. They are bound to happen, but I can see myself running into bumps in the future and not having as much stress and struggle as I did in the past."